Wide Reading - Science in the news. What lesson style suits you? The fundamental property of a diode is its tendency to conduct electric current in only one direction - it is a 'one way' channel for current in a circuit. 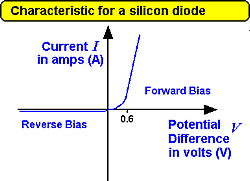 A diode is an electronic component with two electrodes (di (two)) - the anode and the cathode. Most diodes are made with semiconductor materials such as silicon, germanium, or selenium but some diodes are comprised of metal electrodes in a chamber evacuated or filled with a pure elemental gas at low pressure. 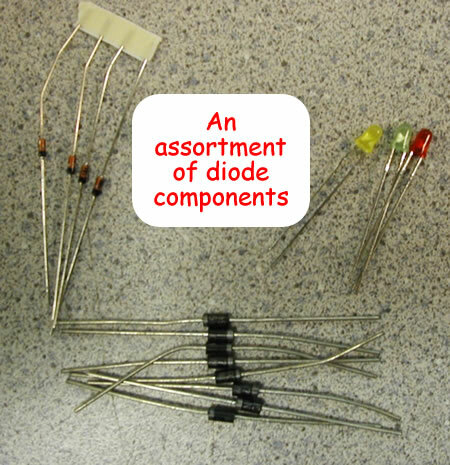 Diodes have a lot of uses in electronics. They can be used as rectifiers, signal limiters, voltage regulators, switches, signal modulators, signal mixers, signal demodulators, and oscillators. is the symbol for a diode. You should be able to draw this symbol from memory. If there are arrows coming out of the symbol, it is called a 'light emitting diode' or LED. This is the type of diode that lights up when it is conducting electricity. LEDs are often used as a signal that current is passing through the circuit at that point. You should know this characteristic curve well enough to sketch it from memory and be able to 'interpret' it. The current through a diode effectively only flows in one direction only. It's resistance is very low when connected in forward bias as long as it has a potential difference of more than 0.6 volts (this varies but is usually about 0.6 to 0.7 volts) across it. The diode has a very high resistance when it is connected in 'reverse bias' - the opposite direction - therefore only a tiny current flows when this is the case. At 0V no current flows. At +0.6V the forward current starts to rise sharply. At -ve voltage there is a tiny current. When connected into a circuit in forward bias the diode is simply like a conductor wire - it has such a low resistance that it hardly affects current flow. The p.d. across the diode in a circuit is about 0.6V - a voltage called it's 'operating voltage' - sometimes the question will state that it is 0.65V or 0.7V). So when analysing circuits you have to remember this. Sometimes the examiner will give you a graph to read the operating voltage from. When connected in reverse bias the diode acts like an open switch in the circuit (it has a very high resistance) so all of the components on that strand will have a negligible current flowing through them - bulbs will effectively be 'off' because so little current will flow that they will not light up. Like a resistor, the diode has only two connectors. One is called the anode (it is connected to the positive terminal of the power supply), and the other is called the cathode (it is connected to the negative terminal of the power supply). The diagram bon the right shows drawings of different types of diodes and their electronic symbol. Notice how the cathode side is marked with a ring or band the ordinary diodes and a flat side and/or short lead because it is important that the diode is connected the correct way round. When alternating voltage is applied across a diode, it will convert the alternating current (AC), which flows back and forth, to direct current (DC), which flows only in one direction - but it only does that for half of the cycle - we say it rectifies the current.It only allows half of the current signal to get though. 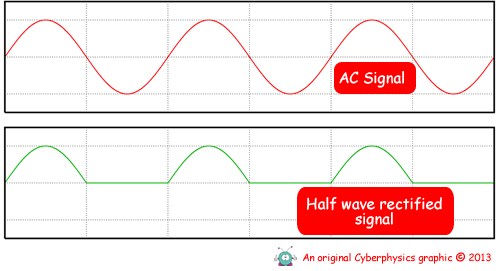 A capacitor can then be used to smooth the signal - but that is beyond the realms of GCSE! A light-emitting diode (LED) that emits more light energy than it consumes in electrical energy has been unveiled by researchers in the US. The device – which has a conventional efficiency of greater than 200% – behaves as a kind of optical heat pump that converts lattice vibrations into infrared photons, cooling its surroundings in the process. The possibility of such a device was first predicted in 1957, but a practical version had proved impossible to create until now. Potential applications of the phenomenon include energy-efficient lighting and cryogenic refrigeration. - see here for the full article... but remember this sort of development should not be included in examination answers... stick to the syllabus! Until the development of high-efficiency and high-power LEDs in the early 2000s LEDs were only suitable as indicator lamps. Recent development in this field has made it possible to use LEDs in lighting and illumination. to read up on this topc.